Tomoko grew up in a Christian home in Japan. She moved to St. Louis, MO in 2000 and graduated from Covenant Seminary with an M.A.C in 2006. After graduating from seminary, she worked at Covenant Seminary for ten years as International Student Nurture Coordinator and Student Life Coordinator. She also worked at CrossRoads Christian Counseling in St. Louis for five years. Her passion for helping others has grown out of her own journey to maturity in Christ in the midst of pain and brokenness. She and her husband Ryan were married in 2010. 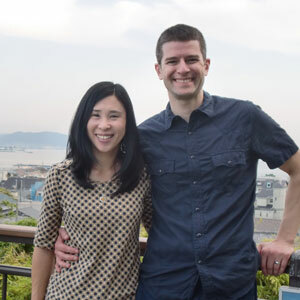 They moved to Japan in August 2017, where Ryan is teaching English as Tomoko follows God's call to start Christian counseling. Biblical counseling is a vital avenue for ministry as the Japanese church offers a safe haven for those who face various issues alone. Although there are tremendous needs, Christian counseling is still not widely available here. There is a six-month waiting list to get an appointment to see one Christian counselor in Tokyo. Tomoko currently has a partnership with MTW's Tokyo Bay Team to begin a counseling ministry in the East Tokyo area in the hope that God will work through this effort to meet this critical need.